Cat in English: Alexa, tell me a joke. I bought Amazon Echo during the Prime Day. I wanted to know how useful this is and it was $50 off, so I placed the order. On the same day I bought 2 sets of Philips Hue starter kit from Best Buy. Each was $50 off, so it’s a great deal. 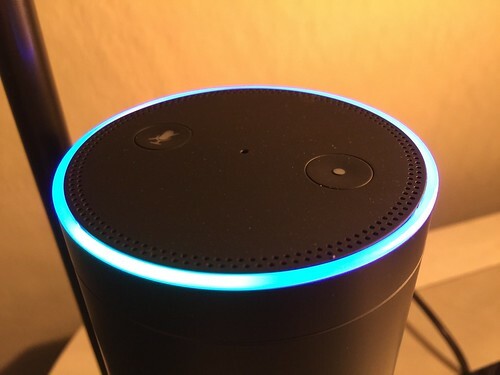 When I received the Amazon Echo, I thought the set up would be easy like Siri. I was wrong. First it needed to connect to Wi-Fi. There’s no way to use Bluetooth to control Echo and set up Wi-Fi. The way it works is it broadcasts an ad-hoc Wi-Fi and you connect to it to set up. After spending 20 minutes on setting it up, the only thing that’s useful and works for me is “Alexa, tell me a joke”. What I really want Alexa to work with is Philips Hue and Logitech Harmony. It can scan Hue lightblubs by itself. It’s smart enough to get all of them. However when I said “Alexa, turn on lights in the bedroom” it told me there’s no “bedroom”. It took me some time to understand that the bedroom concept set within the Hue app isn’t shared. I needed to create a group named “bedroom” in Alexa. That is not very smart. The next one to set up is Harmony. The official page says it’s compatible with Alex, but in reality it needs to go through IFTTT. After setting up IFTTT recipe, I found out I need to use the magic word “trigger” when proxying command through IFTTT. Instead of “Alexa, watch AppleTV”, I need to say “Alexa, trigger watch AppleTV”. If I forget the magic word, Alexa will complain about there’s no “AppleTV”. This is really annoying, because now I need to consciously think about the whether I’m talking to Harmony before issuing a command. I set up Hue two days before Alexa. After setting up Alexa, it seems to create some kind of wireless interference around it. That made some of my Hue light bulbs unreachable from the bridge. I had to move the bridge around and switch channel. That’s extra inconvenience. Sometimes I forget that I should control lights through Alexa or my phone. I just flip the switch and then realize I shouldn’t. I’m going to order light switch cover and Hue wireless dimmer. These two things are two separate patches. They don’t work together, which is a little bit disappointing. I don’t want to modify my light switch. I want to cover it and put the wireless dimmer on top of the cover. Since old style light switch cover doesn’t have a flat surface, I will have to put the wireless dimmer on the side. Overall Alex does what I want it to do but doesn’t meet my expectation of intelligence. I think the problem is the lack of domain knowledge of each device it connects. Unlike Siri, which knows every type of query Apple can handle, Alexa doesn’t know how I group light bulbs into rooms or what kind of devices Harmony controls. I have to set up all kinds of routines to handle the domain knowledge while Alexa is just a voice interface to execute command. In some sense, Alexa isn’t much better than CLI or Alfred. I still need to do the scripting by myself. At best it can accept some parameters when triggering the script. This reminds me of Firefox Ubuiquity, an ambitious project that wanted to process command like “book a flight to Chicago next Monday to Thursday, no red-eyes, the cheapest”. After 8 years, the ability to process this kind of command still seems so far away. Domain knowledge discovery is not solved. Actually, it’s solved in theory but nobody cares. Look at the landscape of public APIs. All these so-called RESTful APIs are not RESTful. They are only CRUD APIs. Nobody cares about the real RESTful API that supports discovery and uses hypermedia transition. (If you don’t know the difference, read REST in Practice.) If devices have truly RESTful APIs, it’s possible for client to discover and negotiate parameters. With a hypertext document describing the APIs, Alexa or any voice interface should be able to describe parameters to me. If I ask Alexa to book a flight, it should be able to learn from the API that it requires date time and destination. If I’ve given these parameters, Alexa should pass them through; otherwise it can ask me and keep the conversation going.